The CBAP® (Certified Business Analysis Professional) certification from IIBA was begun in late 2006 to screen, test, and certify qualified and senior BAs. 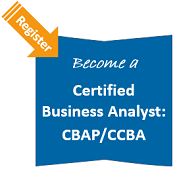 The CCBA® (Certified Competency in Business Analysis) was added in 2011 for intermediate-level BAs. As of this writing, we number over 9200 CBAPs and 1350+ CCBAs around the world, with more added every week. IIBA’s newest offering, the ECBA, is not a certification but a certificate and over 1000 ECBA certificates have been granted as we speak. This article focuses on the CBAP and CCBA and is an update of our past foolproof plans. What are the CBAP and CCBA and Why Become Certified? The CBAP and CCBA were created by the IIBA® (International Institute of Business Analysis). For those of you who don’t know of it, the IIBA is a non-profit organization created to promote the growth and professionalism of business analysis. A large part of IIBA’s mission is to document and maintain standards for business analysis, and to recognize and certify practitioners. Visit http://www.iiba.org/Certification for more information, including qualifications you’ll need to apply for the exam. We estimate there are thousands of eligible people thinking about or wanting to become certified, but who haven’t started yet. Both the CBAP and CCBA applications and the exams are difficult, yet many people do make it through the process! This article briefly summarizes the CBAP and CCBA programs, and how eligible business analysts can create a “fool proof” plan to obtain their certification. Bear in mind that any certification plan is only foolproof if you personalize it, commit to it, and follow it. The majority of the article covers the crucial steps for your plan and several tips to help you execute it to become certified.